For everything there is a season. Sports, farming, fashion … What about “fall” season? Does the time of year affect the types of injuries therapists may be treating in their older patients? Falls are a main cause of injury among older adults, and research shows that about half of all falls among older adults happen when they’re outside, where the seasonal impact of weather conditions would be a factor. Many falls do not cause injuries, but one out of five falls does cause a serious injury, such as a broken bone or a head injury, that would result in a need for therapy to promote recovery. During the winter months, ice, snow and cold temperatures can make life challenging for seniors. Overall, there is no difference in fall rates between winter and other seasons, but the rate of hip fractures is 12% higher in winter versus the rest of the year. 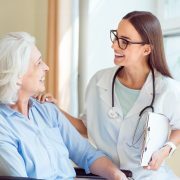 For older adults who fall and are unable to get up on their own, time spent immobile may result in complications – muscle cell breakdown, hypothermia and pneumonia – that affect their health outcome. 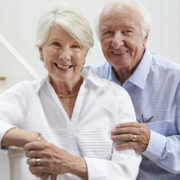 With the arrival of spring, active seniors are ready to replace cabin fever with spring fever. After being cooped up, folks are ready to get out and get moving, forgetting that their bodies may be out of conditioning. Overdoing physical activity results in injuries related to overuse and strain. Something that may seem so simple, such as bending over to plant a flower, may cause an injury in an older adult. Two of the most common reasons for emergency room visits this time of year are injuries from falls and lacerations. Complications, such as ankle sprain, will affect recovery time and slow re-conditioning. The heat of summer can be especially deadly for older adults, who have a special vulnerability to heat-related injuries. Certain medications, reduced mobility and less active sweat glands are some factors which put some adults at risk for heat exhaustion and heat stroke. Other health conditions such as high blood pressure, diabetes or memory disorders compound those risks. Adult trauma cases jump 25 to 30 percent in the summer months. Along comes autumn with shorter days and the first hints of approaching winter. Ushering in holiday season, this time of year sees a spike in musculoskeletal injuries. 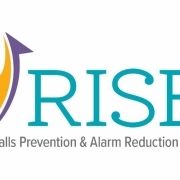 The most commonly reported decorating incidents involved falls, lacerations and back strains. 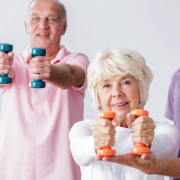 Active older adults transition their summer activities into more regular exercise programs, changes of routine which may be accompanied by injuries. Other seasonal outdoor activities, such as raking leaves and cleaning gutters, are also prime opportunities for injuries. 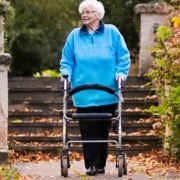 Overall, falls are a common occurrence for older adults year-round. Often these falls cause major injuries such as hip and wrist fractures, head trauma and major lacerations. While younger people often recover relatively quickly from such injuries, older adults face complication which may slow rehabilitation. Therapists – physical therapists, occupational therapists and speech therapists -are integral participants in the rehab process. For everything there is a season … and a time to heal. Partner with Us! Contact HTS today to become your partner in therapy.